Parents of disabled children denounced the Seoul Education Office on Wednesday for making a deal to obtain the support of residents of the Gangseo district in Seoul for the establishment of a special school in the area. On Tuesday, Cho Hee-yeon, superintendent of the Seoul Metropolitan Education Office, Rep. Kim Sung-tae of the Liberty Korea Party representing the district and a representative of Gangseo residents who initially opposed the facility held a press conference to announce their agreement to build a special school for disabled students. The agreement included providing support and a land permit to build a state-sponsored Oriental medical facility, demanded by residents in return for their support for the school. On Wednesday, the Korean Parents’ Network for People with Disabilities and two civic parents group held a press meeting criticizing how the city education office has set a precedent that will mislead the public into perceiving that special schools for the disabled are facilities to be avoided. The parents also demanded Cho step down. “Until when do we have to pay a price to build a special school?” Kim Nam-yeon, the chief of the group’s Seoul headquarters, said in front of the Seoul Education Office in Jongno, central Seoul. 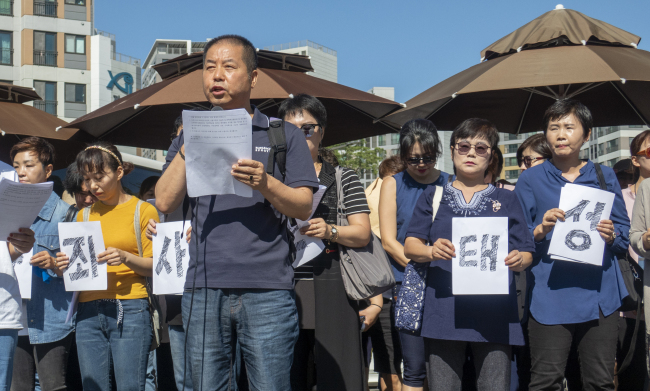 “Maybe Superintendent Cho might think it was a ‘beautiful’ deal, but this agreement deeply hurts the parents,” said Yoon Jong-sul, head of the parents’ organization. The parents’ group reiterated that special schools are mandatory education institutes and not facilities to be avoided. “It has also set a wrong precedent for other special schools,” the parents said, referring to those currently under construction or awaiting building permits. Narae School in Seocho District is currently under construction, while Dongjin School in Jungnang District awaits establishment approval. A policy proposal conference on the education of the disabled, scheduled at the city education office for Wednesday morning, was pushed back 30 minutes due to the protest. Cho assured the protesters they would not have to worry about similar agreements being made in the future. “More have agreed to provide greater support to establishing special schools, after parents with disabled children knelt down to request support,” Cho said at the conference aimed at proposing policies to enhance the rights of the disabled. The establishment of Seojin Special School in Gangseo District was planned in 2013. However, the plan was put on hold as it was met with strong opposition from local residents. Residents who opposed the school claimed that urban redevelopment and regional development of the area had failed them, and as a result, lower-income groups and disabled people had moved into the area. They argued they did not want to attract more disabled people to the area because there is already another special school, Kyonam Special School, in Gangseo. In March, the city education office approved the building of the special school and construction kicked off in August on land formerly occupied by Gongjin Elementary School. The school is scheduled to open in September 2019.